More than just a holiday home, our apartment offers a degree of luxury you will not want to leave. As you enter you will be delighted by the light, the décor and the views of the ocean and mountains. As part of your welcome, we provide tea, coffee, sugar and milk; bottled water, fruit juice, beer and wine. Now your holiday should be off to the perfect start! After you have made yourself at home, you can take a moment to read through the Welcome Information Pack. We have provided all the information you will need to access the WiFi, use the internet TV, the air conditioning and generally orient yourself with the apartment. We have also given directions and maps so that you can quickly find your way to the supermarket etc. and around Puerto del Carmen and the Old Town Harbour. We have provided a safe, so that you have peace of mind knowing that your valuables are secure while you are away from the apartment. Not only do you have the full package of British TV channels, but also Film on Demand, Catch Up TV, and radio. You also have free Wi-Fi throughout the apartment and on the terrace, which is unlimited. The terrace is a great area for relaxing, eating, reading and of course sunbathing, but the Lanzarote sun is very strong, and even on the occasional hazy day, it is easy to burn in a short time. We have installed a retractable sun awning which will provide a shaded area over the terrace, ideal for enjoying a siesta! We have invested in the most comfortable, king size breathable mattress, so that each morning you will wake up after a good night’s sleep feeling refreshed. We believe that holidays are about rest and relaxation as well as having fun! We have taken great care to provide ambient lighting throughout the apartment and the terrace, including beautiful crystal fittings which can be dimmed to the make the most relaxing and romantic atmosphere. There is a double USB socket in the living area for recharging mobile phones, cameras and other portable devices and so there is no need to pack an adaptor. The kitchen is fully integrated and equipped to the highest standard. The apartment is situated in a very private part of the complex and yet it is just a short stroll to the pool, communal sunbathing area and café. All of the apartments on the complex are privately owned and as a community, we take great pride in keeping it to the highest standards. I am very lucky to live on Lanzarote and my mother, Helen Dodson, lives in the UK. Together we manage the bookings for the apartment. This 1 bedroom apartment belongs to my me and Helen has a 2 bedroom apartment on the same complex. The property reference for it is 8161801. My mother works in a school and comes to stay with me in Lanzarote during the school holidays. Even after visiting the island for 20 years, we still love exploring and it only takes a view or an incredible sunset and we fall in love with Lanzarote all over again. After viewing many properties, I saw this one and it was love at first sight. The views of the ocean and the mountains are spectacular and because it is south-facing, the light fills the apartment all day. Although it needed some care and attention, I could see the potential and so I set about re-designing the layout. After a full renovation, I designed the interior and exterior decoration with the idea that guests would be able to enjoy a degree of luxury that is second to none. The 180 degree views of the harbour, the ocean and the mountains can be enjoyed from the terrace and the living area. The south-facing terrace is an all-day-long sun trap! The apartment is easily accessible by car and taxi and located 15 metres from the nearest parking area. The complex is privately run and each apartment is privately owned, It is quiet and perfect for relaxing. The stunning and elegant en suite bathroom comprises a frameless walk-in shower with a rain sense shower head and separate shower hose. The large vanity mirror has incorporated lighting for a bright, shadowless reflection. The bespoke vanity unit has a white, Silestone counter and self-closing drawers. We provide a hairdryer and ceramic plated hair straighteners. The modern WC has a concealed cistern and a soft, self-closing lid. There are 2 air conditioning units: one in the living area and one in the bedroom. Operate on a 'pay-as-you-go' basis via a coin meter, which takes 1 and 2 euro coins, 1 euro gives 2 to 3 hours use. The air conditioning units also provide heating. On arrival, the king size bed is made up with the finest hotel quality linen. Each week the linen is changed. The washing machine is neatly stored out of the way in the terrace cupboards and use is free of charge. Parking is available around the entrance, just 20 metres away. The WiFi is free, unlimited and accessible throughout the apartment and on the terrace. A hand towel, bath towel and bath sheet are provided for each person. Towel for use on the sun loungers are also provided. A clean set of towels is provided each week. The living area has views over the ocean and mountains and is not overlooked. The decoration is modern and luxurious with dimmer lighting to create the perfect ambiance. The full-size dishwasher means that you can spend less time doing chores and more time enjoying yourself. We provide the dishwasher salt and 4 dishwasher tablets. The fridge and freezer are integrated and both are cabinet size. There is plenty of storage space and we have provided glass containers suitable to go from fridge/freezer to oven or microwave. The ceramic, induction hob has 4 heat rings, making food preparation uncomplicated. The full-size, electric oven and grill are ideal for preparing meals. The microwave has various heat settings, including defrost. We provide crockery and storage containers which are suitable for use in the microwave. The coffee maker will give you the perfect cup of coffee every time. We provide a variety of pods on arrival. We also provide a kettle. We provide basic pantry items such as sugar, salt, pepper. The kitchen is fully equipped with a matching dinner service for 4 places and glasses for beer, water, wine etc. There is a complete range of cooking utensils and storage containers. The designer, fitted kitchen is fully integrated. The counter, which incorporates the draining board is made from Silestone. The kitchen is fully equipped and ideal for self-catering. The dining area is within the kitchen and living area. There are two seats, but we have provided 2 fold-up chairs should you wish to have guests. The smart TV is the latest 4K 47" model. We provide SKY, SKY SPORT, the FULL UK TV package (77 channels: all BBC channels, ITV, Channel 4 etc. ), Catch Up TV, Film on Demand and 130 radio channels. The terrace has panoramic views of the ocean and mountains. It is private and has the sun all day. There is a retractable sun awning to provide shade, 2 luxury sun loungers and a table with 2 chairs. The swimming pool is immaculate and maintained to the highest standard. There are sun loungers around the pool on the communal sunbathing terrace. The pool is for the exclusive use of residents. The apartment is on the ground floor with no other apartments above or below. It is situated in a private position on a pretty path within the complex and within a short stroll you are at the crystal clear swimming pool, communal bathing area and café. The private sun terrace has a table and chairs for eating 'al fresco' while enjoying the spectacular view. 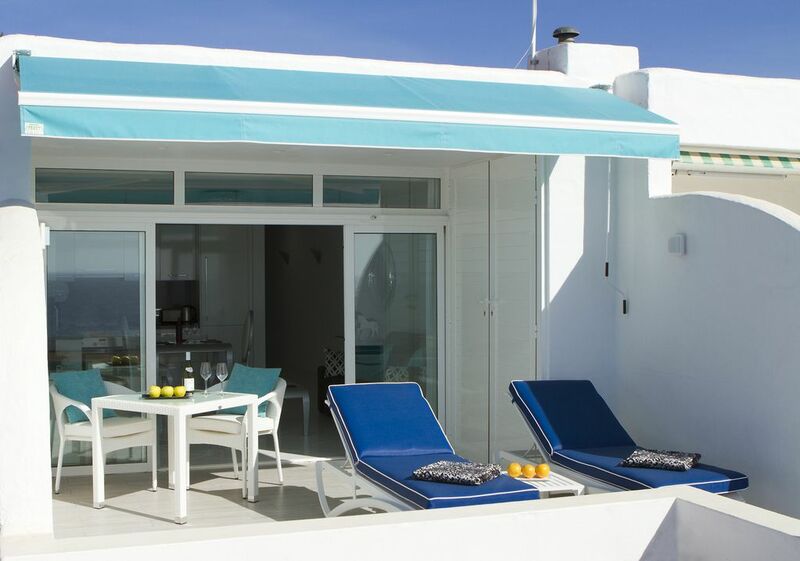 You can sunbathe on the ultra-comfortable sun loungers, there are 2, or wind out the sun awning and enjoy a siesta in the shade! The communal gardens are landscaped and beautifully tended. You will find many varieties of cacti and native plants. We supply beautiful bed linen, bath towels and towels for use on the sun loungers. Each week the linen and towels are changed and the apartment is cleaned. We have provided a hairdryer, ceramic hair straighteners, and an adaptor for an electrical shaver, and should you need them. What an absolutely beautiful apartment, everything is top quality, bed really comfortable, and the view from the terrace what can I say amazing, you will have to take my word and see for yourself. Louise and her mum are really nice friendly people and getting picked up and dropped off at the airport was an added bonus. Really looking forward to going back and hopefully I can get either Louise or her mums apartment. Thanks again we had a superb time. From the moment that the apartment was booked until the goodbyes at the airport, Louise and Helen have been perfect hosts, thoughtful additions like airport collections, an extensive welcome pack and a comprehensive introduction to the apartment, only added to what is a fantastic apartment in a great complex. Stepping through the door into Louise's world, WOW, what a place and what a view, we feel lucky to have found you. We have stayed here several times, which probably says it all! It really is like coming home with every little detail beautifully put together. Everything about this apartment is superb: the location, the private terrace, the views, the furnishings/equipment, the communal pool and the peace and quiet. It is unusual for us to eat in very much when on holiday but in this apartment it is a delight on a cooler evening, particularly as there are numerous English TV channels available. The supermarket on the hill nearby is very well stocked, so access to supplies is not a problem. That having been said, it is only a short walk to the Old Town or the start of 'The Strip' where the choice of restaurants and bars is phenomenal. We had a wonderful stay and have three more bookings in the pipeline! Grateful thanks to Louise and her mum who we were pleased to get to say 'hello' to. This apartment is special and brilliantly managed - clean, luxurious and the welcome pack of drinks/snacks is a thoughtful and much appreciated touch. A beautiful property in a well located area, nice & peaceful. The property itself was modern, clean & so comfortable. The owner Louise was so helpful & gave us a warm & friendly welcome. The welcome pack was the best we have ever had. We hope to return again. The complex is peaceful and relaxing. The gardens are beautifully tended and importantly the swimming pool is immaculate and maintained to the highest standard. The apartment is ideally located. It is just a short stroll to the charming Old Town Harbour bars, restaurants and the local beach, Playa Chica. While the busier seafront promenade, its fantastic range of restaurants, bars and seemingly never-ending beach, Playa Grande, are just a 10 minute walk. Since I have refurbished the apartment, I love to stay at home and luxuriate in the style and comfort of my surroundings. I have everything we need! I do, however, still manage to go out for a long and leisurely lunch occasionally! I do not have a specific changeover day and check-out is at 10:00 or before and check-in is from 14:00 onward. I try to be as flexible as possible and it is strictly by prior arrangement. In the case that you have a late flight and you have to check out earlier, I may be able to help by looking after your luggage. If you do decide to book, initially, a deposit of 25% plus the HomeAway service fee will be payable and the balance is be payable 45 days before the date of arrival. You will also be charged a security deposit of £75.00. I haven't asked for a security deposit until now and I have never had any damage to my apartment, just the occasional glass! However, entry to our complex pool is now by entry card. It will cost 75.00€ to replace should it be lost. I have decided to charge the security deposit for the pass in the hope that guests will be extra careful with it. The security deposit will automatically be returned after 7 days if it has not been lost. I hope you understand! I will send you a booking form to be completed when you have the details of your flight. The form includes your address, contact details while you are staying,travel details and of course whether you would prefer red, rosé or white wine waiting for you. 10 days before the date of arrival, I will send you an email with the directions, the maps, and the code to the exterior key safe. It is very simple to use. I am usually here in Lanzarote to meet guests and make sure that they have everything they need during their stay. We advise all guests to have travel insurance, a European Health Insurance Card (EHIC- free) and/or private health insurance.